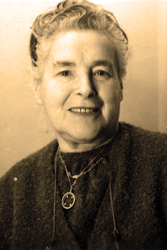 Emma Arnold (née Bortot) was born on April 17, 1898, in Strasbourg, Alsace. Already by age four, she had lost her father and was raised on a mountain farm in poverty. During World War I, French and German armies fought fiercely on a battlefield near her home. At age sixteen, Emma had to nurse wounded and dying men from both sides. Emma grew up in a devout Catholic home and hoped to become a nun. However, because of family need, she went to work in a factory as a damask weaver. There she met Adolphe Arnold, and the two married when she was 25. Emma won Adolphe’s heart as a devoted wife. Her sewing and cooking skills blunted the sting of their poverty and made their simple dwelling into a real home. When their daughter Simone was born in August 1930, Emma raised her with a firm but loving hand, teaching her to love flowers, to love her hard-working father, and to love God. When the family moved to an apartment house in Mulhouse, the neighbors came to respect Emma as a kind, dignified, and honest woman. Emma began an intense study of the Bible in Spring 1937 and soon began sharing her newfound faith as one of Jehovah’s Witnesses. Many townspeople enjoyed listening to her earnest and logical words. Simone and then Adolphe likewise embraced the faith of Jehovah's Witnesses, even as the looming Nazi threat approached the French borders. The Gestapo first arrested male Witnesses, thinking that this would mean the end of the Witnesses’ religious activities. After Adolphe’s arrest, Emma kept up her Bible teaching work in secret, but the Gestapo soon came calling. They cross-examined Emma for four hours, trying in vain to force her to betray her fellow Witnesses. They returned several times to search their home and intimidate them. In July 1943, juvenile authorities took custody of Simone. The next month, Emma was arrested and sent to the Nazi camps at Schirmeck and Gaggenau. In camp, Emma faced solitary confinement for her refusal to do work to support the war. At one point, the guards put her in a cell next to their interrogation room, where she heard screams of torture victims and saw their blood trickling under the door of her cell. After her return to the barracks, Emma helped other prisoners survive, only to fall severely weak in the final weeks of the war. Four fellow Witness prisoners saved her life, smuggling food to her and staying with her even during a bombing raid. When the German army retreated and the Allies freed the prisoners, Emma went in search of Simone. After a tearful reunion, they returned to Mulhouse, hoping to find Adolphe and rebuild their lives. Weeks passed without news, but just when it seemed that hope might go dark, Adolphe arrived, barely alive. Emma nursed him patiently, helping him learn to live with the disabilities he would carry the rest of his life. Having passed through a test of faith and fire, the close-knit Arnold family shared an even closer bond of understanding and love.